the number system is rather simple, as long as you memorize 1-10 and 100 and 10,000 you know the numbers to 99,999. For any purpose, we shouldn't need to go above this. For 100, the suffix "ma" is added to the word for 1. At 10,000 a new suffix, den, is added. It helps me to think of 10,000 as 1,0000, as if instead of saying tenthousand, we say one-den. Make sense? 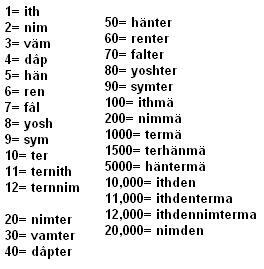 In much more casual situations, as in English, they simply list the numbers one by one, making 17,189 simplified to "ith fal ith yosh sym" OR "Ithden falterma ith yosh sym". Inanimate objects: after the number, place "pen". Translate. Use the dictionary to help with the words. Email answers to oatiepoa@aol.com. 1. I taught 2 lessons. 2. Do you speak 4 languages? 3. Oye mo ith-den fen ne tenir.